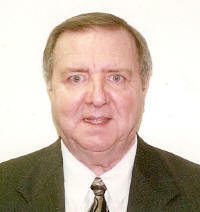 Lawrence R. Merian, 66, of St. Louis, formerly of Breese, died Wednesday, March 7, 2007 at his residence. Mr. Merian was born April 23, 1940 in Breese, to Marie (Pollmann) Gebke and the late Raymond Merian; his mother survives in Breese. He is also survived by two sons, Bruce (Laurie) Caputo of Grayslake, IL and Brian Caputo of Vernon Hills, IL. Lawrence retired from Great Northern Trust in Los Angeles, CA where he worked as a Trust officer and later became the Vice President. In his earlier years he attended St. Augustine Grade School in Breese, St. Henry’s Prep Seminary in Belleville where he graduated in 1958. He then attended St. Mary of the Lake Mundelein Seminary in Mundelein, IL. He was a member of the Cathedral Basilica of St. Louis, St. Louis Art Museum, Missouri Historical Society, and Missouri Botanical Gardens. Funeral Mass of Christian Burial will be Saturday, March 10, 2007 at 10:00 AM at St. Dominic Catholic Church in Breese with Fr. Patrick Peter officiating. Interment will follow in St. Dominic/St. Augustine Cemetery, Breese. Visitation will be Friday, March 9, 2007 from 4:00-8:00 PM and again on Saturday, March 10, 2007 from 8:00-9:45 AM at the Moss Funeral Home in Breese.